It’s become the phrase of the week: the Deep State, a cabal of anti-Trump ideologues seeking a coup against a democratically-elected president hiding within the warrens of the CIA, State Department, and any other agency that can be labeled as “shadowy.” The reputed “Deep State” is the boogeyman of the Trumpistas frustrated that their president is unable to enact his agenda instantly and without opposition. It appeared in December on Brietbart, the alt-right news site, without much evidence to support the claim. It has again appeared in this wildly distorted, irresponsible piece from the DC Daily Caller, which fails to support itself even as it peddles conspiracy. The term “Deep State” won currency after the 2011 Egyptian Revolution, when media sources began to debate if pro-Mubarak regime elements might return Egypt to its status-quo ante. It’s relatively new, and it appears to have originated in the 1990s to describe Turkey’s coup-happy Kemalist generals. Like the term “fake news,” it has gone viral, and now is being thrown around with abandon. Like fake news, deep states are real. But the United States of America does not have one. By looking at a true deep state, Egypt, we can understand why. Deep states: ideological militaries who run weak states over strong nations. To make a deep state, you need a few key ingredients: like a cake, lacking a critical ingredient like sugar will spoil the dessert. In geopolitics, it will cause a civil war, or worse. Deep states can only take hold in very particular places. They must be secure so a coherent ideology has time to develop and take hold, usually over decades. The United States and Egypt both have that: the U.S. is secured by two oceans and two peaceful neighbors, Egypt by huge deserts, a treaty with Israel, and weak neighbors to the south (Sudan) and west (Libya). Both Egypt and the United States do have dominant state ideologies: Egypt is still dominated by crusty old Arab nationalism, while the United States has democratic neoliberal capitalism. Both states run militaries that are empowered and motivated by their respective ideologies. If you’re a Brietbart believer of the American Deep State, so far, so good. Deep states must also exist above strong, well-developed nations with cohesive identities. Deep states function by manipulating the state, not the nation: they must be able to take the nation for granted. When a deep state makes a power grab, it can only succeed if it’s playing for a very small set of turf within the state itself. If it has to navigate between nations, it complicates its work, and risks civil war. This actually happened in Kemalist Turkey: Kemalist deep state coups led to wars with Turkey’s Kurds, most recently when a coup in 1980 helped bring about a murderous rebellion by the country’s Kurds who felt discriminated against in the aftermath. Both the United States and Egypt have strong national identities (even if America’s sub-cultures can make it appear otherwise). Once more, if you’re a believer of the Deep State, the evidence holds up. Yet that is as far as the comparison can go. If all you need to believe is that any country with an ideological military and a strong nation can develop a deep state, count yourself convinced. But if you’re going to bother with critical thought, we must dig deeper. And a major flaw of the American Deep State theory is that a deep state needs a weak state to survive; America’s is not. What does a weak state look like? For one, it’s horrifically ineffective: not a “I can’t believe they made me wait 45 minutes for my driver’s license when there were only six people in front of me” nuisance, but “I can’t believe I had to spend 2 years, $4000, and know an official at the Ministry of Transport via a relative to get my license”-style corruption. It is a state that fails to provide water, electricity, schools, and roads on a vast scale every single day. It is this kind of school system in Egypt, not this outlier from the United States. It can seem like the United States has a weak state when you compile the many anecdotes of bad roads, bridges, schools, water supplies, and other creaky public services. But this is misleading: just because you know a lot of stories about a topic doesn’t mean you know anything about its societal scale. When it comes to the strength of the overarching American state vs. the strength of the Egyptian state, the U.S. comes well out well ahead. Egypt is a 38th on the Fragile States Index; the U.S. is 158th (with 1st being Somalia). The United States is 8th on the Human Development Index; Egypt is 108th (the 1st being Norway). The United States is 18th on the Corruption Perceptions Index; Egypt is 91st (with Denmark as 1st). The U.S. is not even close to the bottom of the HDI. All are powerful indicators that the America state, from the local to the Federal level, is more resilient (the Fragile States Index), more capable of delivering development to its citizens (the Human Development Index), and far less corrupt (the Corruption Perceptions Index). This is not, in other words, a place where a deep state can thrive. The conspiratorial nature of deep states requires states that are too weak to stand up to insiders, too corrupt to hold themselves accountable, or too inept carry out basic services. The American state is not perfect; no state is. Yet media hype overblows its weaknesses: despite the tragedy of Flint’s water supply, it remains remarkable that a country of 320 million people has had access to reliable, safe drinking water for many decades. Egypt, conversely, is a state unable to do much beyond basic security. Cairo, the capital, often suffers blackouts; it has polluted the Nile so heavily that it threatens its own water supply. These are the consequences of a weak state: poor resource management, terrible services, a place of such bad state governance that a committed ideological military cabal can take advantage. There is also yet another critical argument against an America deep state: the regular transfer of power. While the United States has peacefully transferred power since 1789, Egypt has only had a single democratic election. Egypt has had 5 presidents since 1952: only one of them was not a committed Nasserist (Mohammed Morsi, the ill-fated Muslim Brotherhood president of 2012-13). Egypt has had over 50 years to plant Nasserist supporters in all branches of a very weak government. In the same time period, the U.S., has had 13 presidents, alternating routinely between different political parties, which have themselves hardly remained constant (Abraham Lincoln Black Republicans, for example, don’t exist anymore). The American state has seen real change: while that process can feel slow, the U.S. government of 2017 is a very different place than that of 1987. What frustrates Trump and his allies is not a conspiracy of a CIA/State Department/journalists/Democrats/Obama/Pentagon cabal, agenda-driven to impose some secret world order upon the United States. Rather, they are encountering the hard edges of America’s geopolitical interests. As the Trump administration and his supporters have long had a wanton disregard for facts, this should be no surprise: delusion has consequences. Trump complains loudly that too many people are noticing his Russian ties: this is because it is not in America’s interests to align with Russia any more than it has to, especially under the Putin government. So long as Russia has an independent foreign policy, it will be a threat to both NATO and the American-led world order; only bringing its foreign policy into the American-led alliance system will end that condition. (As I argue in my book). Trump also dislikes that journalists notice his cowboy approach to war results in OK Corral-style casualties: the Yemen raid that killed Navy SEAL Ryan Owens appears to have been unnecessary, while more effective Obama-era plans have helped push al-Qaeda out of a key Yemeni port alongside Emirati and Yemeni allies. It is not in America’s interest to throw around its power simply for the sake of it: the U.S. has now entered an era where it must carefully manage its military prowess to greatest efficiency rather than presume it can steamroll any opposition. Which is why the Trump administration complains so loudly whenever its policies are opposed. Trump appears to have believed the president of the United States was not merely the most powerful person on Earth, but actually all powerful, like some kind of modern geopolitical god. They are not the same conditions: being powerful still means having limits, something that Trump and his allies don’t seem to understand. As the deep state accusations grow, it would behoove some to visit Egypt, stay a while, and try to get a driver’s license. That is what a place with a deep state truly feels like. Ryan, I’m a new reader to the site and I’m shocked at the degree to which you can articulate and often confirm my suspicions about geopolitics and foreign policy. I’ve become really interested in geopolitics; what are the best resources for studying it/learning about it? This site really deserves more views. Keep up the great work! Thanks Patrick! 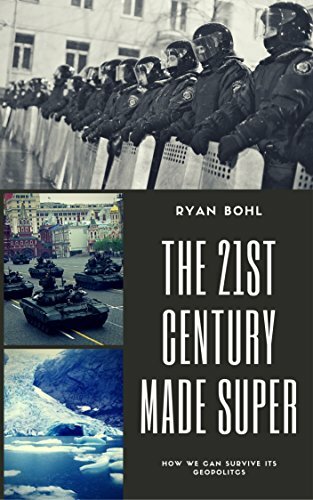 Without sounding too much like a self-promoter, my book’s first two sections deal with a broad overview of geopolitics leading up to 2017. There are other great sources like George Friedman’s The Next 100 Years, Robert Kaplan’s The Revenge of Geography, and Henry Kissinger’s World Order. There are loads of other books I might recommend for specific overviews and country studies as well, depending on your interest – do let me know if there’s a particular region you want to focus in on! And of course, the site always gets more views thanks to shares, tweets, subreddit shares, etc! The question is how a deep state is defined. Also, while there has indeed been differences of ideology and domestic policy between the 13 US presidential administrations since 1952, all of them have broadly shared the same vision regarding foreign policy. Trump has openly stated his desire for a reapproach with the Kremlin and has since the 1980’s argued for less US involvement. Judging by the election results, enough American citizens shared those concerns (we both know they don’t, but Democracy needs the idea of the illusion of an enlightened electorate) to elect him to the White House. Trump represents a radical break with all previous Post-WW2 administrations. So this is the question, if the electorate decides to go “America First” and disentangle the United States from NATO and instead make a realignment with authoritarian states like Russia and China, does the US Elites (we can agree that there are US elites) have the right or the duty to undermine such a self-destructive policy which the Electorate has opted to support? If the American people would want to leave NATO and abandon all US military bases (now let’s ignore the consequences, and let’s just focus on the principles), would they be entitled to that right? In fact, the same discussion could be utilised for countries such as Egypt and Turkey, do the inhabitants in these countries have the right to democratically elect islamists who would move these countries away from secular values? In short, that Trump’s policies are stupid does not necessarily mean that they are illegitimate. Criticism of his stupid policies of course is legitimate, but if the intelligence community moved to undermine his stupid policies, it is in fact (however virtuous it might be) illegal. The United States is not a technocracy. What needs to be discussed is where the gray zone of obstruction turns into illegal activities. Does not the foreign policy experts, the military and the intelligence community have a constitutional duty to for example refer critical information to the president? I am sorry to write this, but your argument in this blog post feels quite circular – “the US has no deep state because it has no deep state” – and borders on the semantic. It stands clear that many internationalists and geopolitical strategists within what could be called the US Establishment or Beltway would sleep more comfortably if Trump somehow goes the way of Morsi (to borrow your Egypt analogy). Is your position that foreign policy should be an area above the reach of popular will and be subject to expert rule? That’s a very solid point, and one of course debated by the Athenians themselves on down, especially after Athens nearly democratically exterminated Mytile one day and then switched their minds the next. To your point, however, I think a balance must exist that favors experts while bringing in the democratic impulses of the population. Part of me is glad that no insider candidate won in 2016; the panel of neoliberal experts appointed milktoast candidates for both the GOP and the Democrats. It’s unfortunate that this resulted in a nativist populist rather than a more socialist candidate in my view, but at least the cycle of neoliberal insiders appointing presidents was broken. That being said, the agencies of the United States do have an obligation to stand up to poor policies of any president by either leaking information to the press (risking their jobs) or by providing evidence to Congress or the opposition party that the president is making decisions that actively harm American interests (their constitutional duty anyway). Checks are balances do a relatively good job of this, and while I totally agree that Trump is a legitimate president (barring concrete evidence he broke the Logan Act prior to the election), that does not mean that experts within the state should suddenly become lock-step followers. I would not argue for a technocracy in the United States, though I say that the middle and lower echelons of the state should be stuffed with technocrats who should provide some slowdown to changes enacted by presidents without experts as advisors. The question still is, if an administration came to power with the stated objective to disentangle the United States from Eurasian geopolitics, to what extent would the grey cardinals within the foreign policy establishment have the right to thwart that agenda? Would you say that – theoretically speaking – overthrowing such an administration or striving to find an impeachable offense would be a legitimate goal in relation to the prospect of a “world without America”? That is a fascinating thought experiment. On the whole, it would be preferable to find an impeachable offense – doing so is within the bounds of the Constitution, and so therefore does not upend the state beyond disrupting – temporarily – some aspects of the chain of command. A proper coup would only be acceptable if a president were colluding with an enemy power to withdraw from Europe, and if all Constitutional methods of removal had been exhausted. That being said, it took the United States a full half century before it became entangled in Eurasia (from the Spanish-American War to World War II). Breaking all those alliances, without suffering a massive electoral defeat at a mid-term election, or being tossed out by an angry cabinet via the 25th Amendment, seems like a huge ask for a mere four years. I don’t doubt for a moment that an America president who openly returned to 1930s-style isolationism would lose any election, and so a president with that kind of bent would really only have 4 years to do so. Even then, I think there would be enough of an outcry that they would be slowed, and a new president with a fresh mandate could undo their damage.